To complete this transformation, GigaParts technicians expertly remove the front bezel along with the top and bottom covers of the radio. 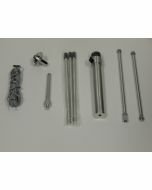 Those items, along with a set of MB-116 front handles are delivered to a local company whose skilled craftsmen then mask, prep, and prime the components. After a base coat of paint has been applied and has dried, a camouflage pattern printed on a special film is placed on the surface of water in a large vat. The film dissolves in the water leaving the pattern floating on the surface which is then sprayed with an activating agent. Each component is then dipped into the water through the floating layer of liquefied pattern which adheres to the component. The components are then washed and dried before a final protective matte clear coat is applied. The parts are then returned to GigaParts where our technicians reassemble and test the radio before re-boxing it. 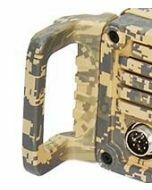 Depending on demand, we often have camo radios in-stock, ready for immediate shipment, but, if we don't, the whole process should add no more than 7 to 10 days to your order. Your satisfaction is guaranteed! If you are unsatisfied with the quality of this paint job you may request a full refund within 7 days of delivery if the radio has not been operated and its accessories and packaging materials are in new, perfect condition. If properly cared for, the camouflage paint job should look great for many years, but after 7 days, no warranty applies to the paint job. Warranty: The radio itself remains under a factory warranty for 1 year of your date of purchase. 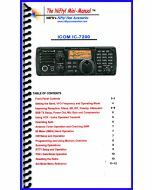 With an excellent balance between cost and performance, the IC-7200 will open the door for ham beginners to the HF world, as well as will satisfy long experienced operators' needs as a secondary rig for carrying out to the field.